Our last full day in Japan has arrived. After 2 full days in Kyoto, we are finishing up in neighboring Osaka, which is closer to the airport we will depart from (KIX). Since the weather had finally fulfilled its promise of being miserable - ie: cold and wet - we decided to not stress about doing “sightseeing” and rather just enjoy our vacation. That meant, first and foremost, not rushing to get out the door at the crack of dawn. We got up and went down the street to grab some breakfast items from a nearby bakery. The rain hadn’t started to pound down yet, but there was a drizzle. We grabbed an assortment of goodies then headed back to the hotel. We had gotten two free coffee vouchers from the hotel and Jessica used one while we enjoyed our breakfast at the hotel restaurant/seating area. While we were down there, we head those British “lads” again at the front desk. They didn’t see us, but we heard them talking to the front desk staff. It sounded like they were checking out and gave the staff a bottle of sake that they couldn’t take with them. Too bad we hadn’t run into them; we would have gladly taken the bottle! Once finished, we got ready and packed up our stuff. Since we didn’t need to check out until 11am, we decided to make the most of our room and stayed until we needed to leave. We headed out and made a pit stop at a curry house. We’d had a light breakfast and decided that before travel, one really should have a full stomach. Plus, I had been wanting to have tonkatsu (a dish comprised of fried pork cutlet over rice); we’d past this restaurant yesterday and knew we wanted to come back. 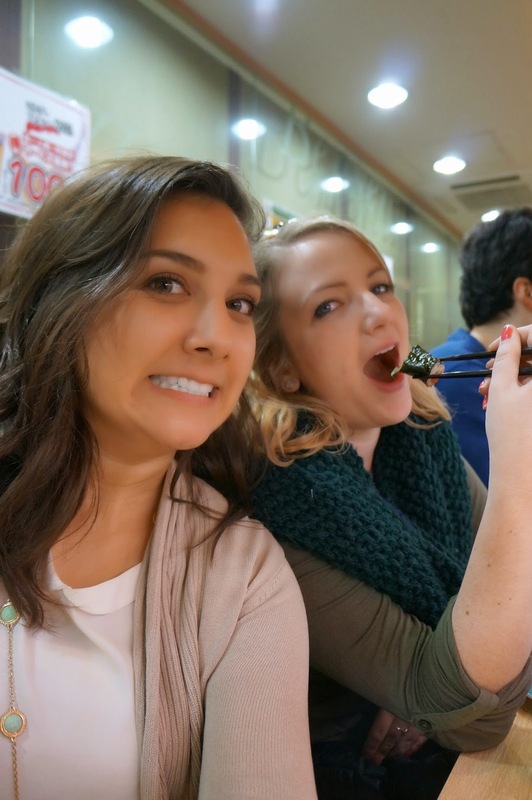 Jessica loves Japanese curry anyway, so it was a win-win. We arrived as the restaurant opened and each ordered half-sets of curry. They came quickly and they were delicious! Including a drink the whole set was around 500Y (~$5). A good deal, in my opinion. We left there and walked along the main street towards Kyoto Station. It was around a mile away, but we had some good scenery as we walked. We walked by another palace/temple place, and I wishes that we’d have been able to go inside, but we had all of our luggage and needed to get to Osaka. Once we got to the train station, we searched for the right ticket counter. Kyoto Station is quite large and there were hoards of people. We walked by one line (for a bus) that had probably several hundred people in it. Dang! We got our tickets easily once we found the counter and followed the signs to the correct platform. We boarded and found two of the last remaining seats (not next to each other of course). I wrote yesterday’s blog and we arrived shortly thereafter. It was only about 30 minutes total. When we got to Osaka Station, we needed to change to another line and head to Tennoji Station. It was supposed to be 190Y, but we weren’t sure if we should walk out of the gates, buy another ticket, then come back in, or if we could add money to our tickets, or what. 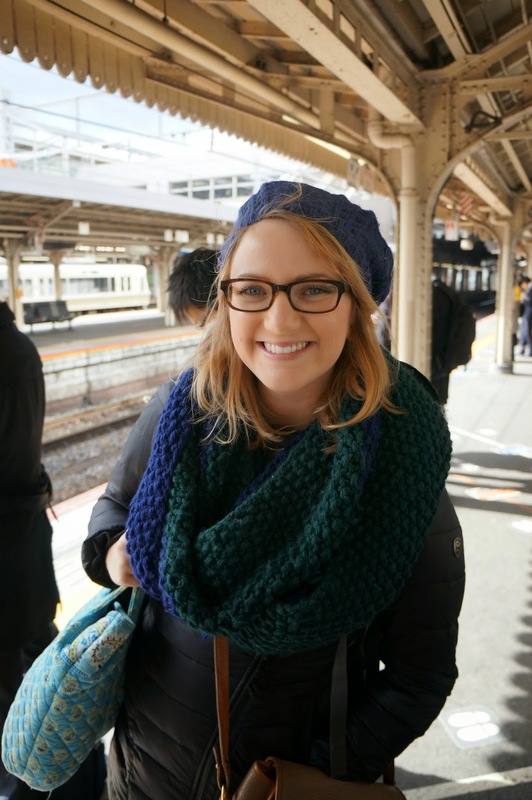 I found someone official and asked; she told us that we could pay the difference once we got to Tennoji. We headed to that platform and rode the train another 20 minutes or so to the south part of Osaka where our hotel was located. We arrived and went to the ticket information desk. When I told the man we needed to pay the additional fare, he showed me a calculator that read 380Y. I shook my head no, and told him 190Y? He proceeded to explain to me, in his best attempt at English, that to transfer from Kyoto to Osaka and then to Tennoji, the additional fare was 380; if you were to go out of the gates and buy another ticket, then it is 190. When he showed the 190 again, I nodded vehemently and pointed to it and said “That’s what we should pay!” He shook his head and again told me the same thing. I basically told him that was ridiculous and we left. Our options were thus: pay the fare (more than double what we had planned to pay); ride the subway back to Osaka station, get out, buy the additional ticket, and come back; try and sneak out. Well, being that we are good law abiding Americans, we decided to try and bust out. We found an exit that wasn’t being watched by the jerk I just talked to (okay, really he wasn’t a jerk, just doing his job, but I’m bitter). I let Jessica go first as she put her ticket in the machine, it gave her an X, and she pushed through the plastic mini-doors. In Korea, if you do that, they just kind of give up and go back to normal; however, Japan doesn’t let you get away with it. It started to beep loudly at her, so she went back through the gates. THEN the doors appeared on the other side instead. Some old Japanese ladies were staring at us and one of them went to a help-phone on the wall and called someone. Cripes, here we were, the OBVIOUS foreigners they just told how to pay the fare, and now we’re trying to break out, caught red handed. My adrenaline was up, but Jessica wasn’t to be deterred. She pushed through and we fled the scene before officials showed up. Our next plan was to pay the additional fare on one ticket, then both of us sneak through. We split the 360Y to 180Y a piece, then went back to the unguarded gate (by now being cleared of any on-looking Japanese women or jerk-officers. Luckily this gate appeared to be for handicapped or something, so it was extra wide, and we put the ticket in and both walked right through. When we got to the hotel, I could immediately tell that it wasn’t going to be the same experience as Kyoto. The interior felt very Asian; I can’t quite explain why I feel like this is Asian but it was all while fake-marble with light pink flowers and advertisements everywhere. The lobby was tiny and the guy checking us in spoke some English but was obviously flustered to talk to us. We got in the elevator and we barely fit. This may have been the smallest elevator I’ve been in, including ones in Europe which are also quite small. We were nose-to-nose, as I had my backpack on and Jessica had her suitcase. We stepped into the hallway on level 4 and I immediately thought of Korea’s “Love Motels” - again, I can’t quite explain why. Maybe it was the room numbers that were lit up according to occupancy outside the room, or maybe just the feel of the place, but I definitely think it was the Japanese version of a “Love Motel”. We opened the door to our room, which was partially covered by a fake tree in the hallway, and sure enough, a Love Motel it was. It was so small and dingy compared to the Kyoto hotel! Honestly, if we had come to this hotel first, I probably wouldn’t have thought much of it, but after being at the really nice hotel in Kyoto, this was crap. We put down our stuff and had a bit of a rest. It was still kind of miserable outside, but we decided to check out our surrounding area a bit. 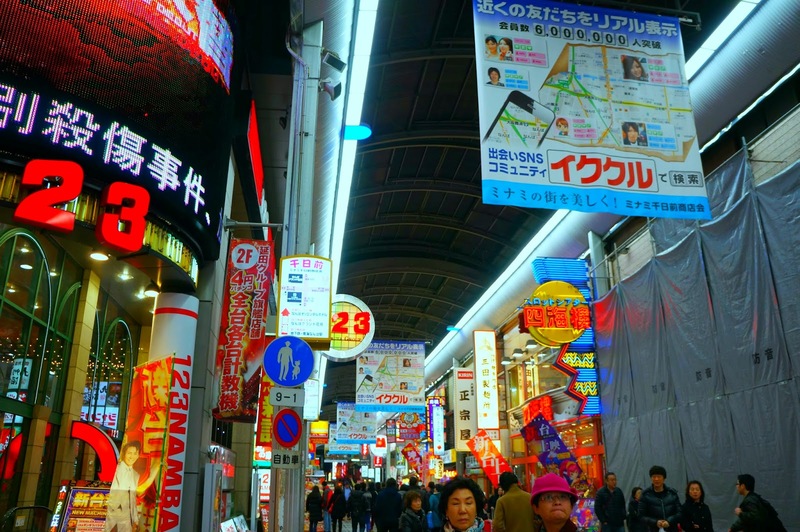 We walked down to the station area and walked through the shops both on the street level, as well as underground in the station area. We found some cute souvenir chopsticks for 100Y and each got some. 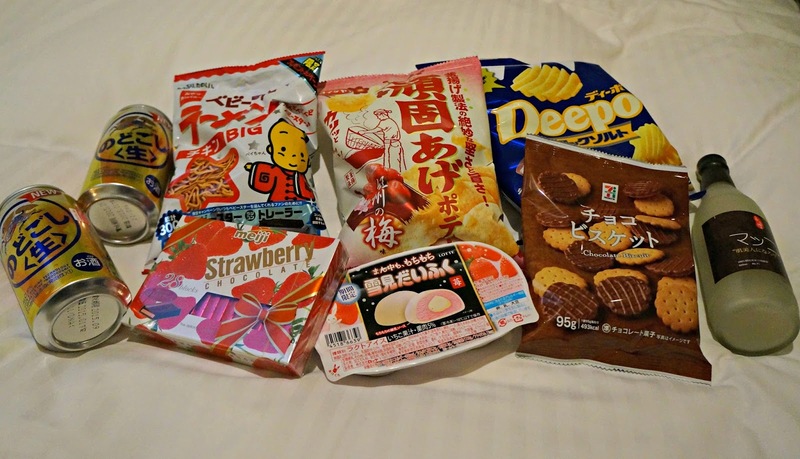 After a while, we decided to get some Japanese snacks and go back to the hotel and watch the Korean drama we’d started called Heirs. We got a couple varieties of chips, including some that I think were cherry blossom flavor, some mochi ice cream (also cherry blossom flavor? ), and of course chocolate. We watched an episode of the show, then I finished the blog and worked on photos. 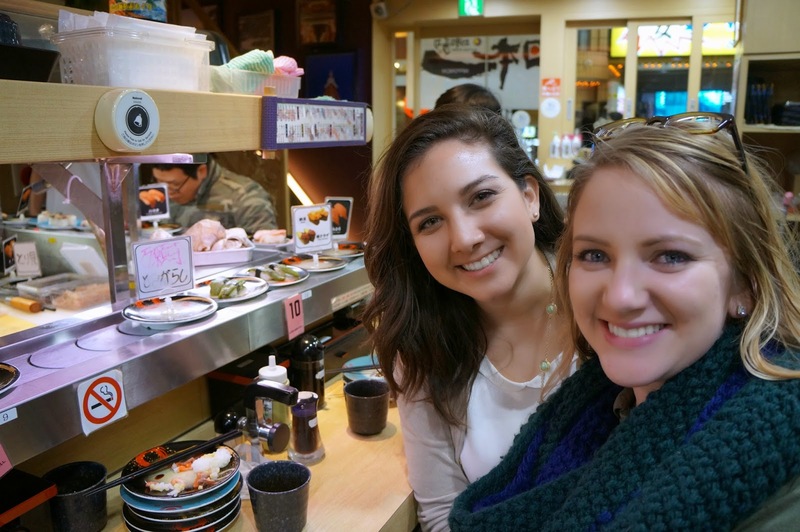 After a while, we decided that for our last meal in Japan we wanted to have sushi! 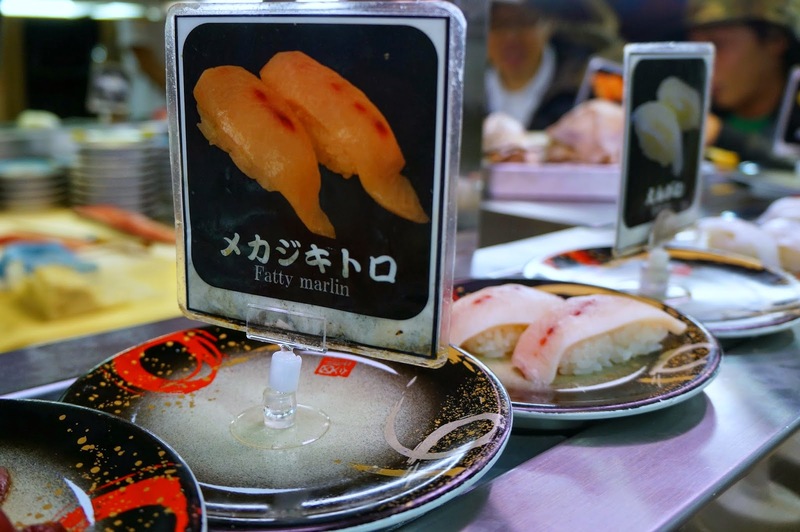 Sushi in Japan can be quite expensive (more so for the quality of both fish and chef, more so than the availability of the fish…) so we decided to look for a “kaiten sushi” bar - the conveyor belt sushi. I found one near Namba Station, and while we didn’t particularly want to travel and spend more money, we decided for our last meal it was worth it. 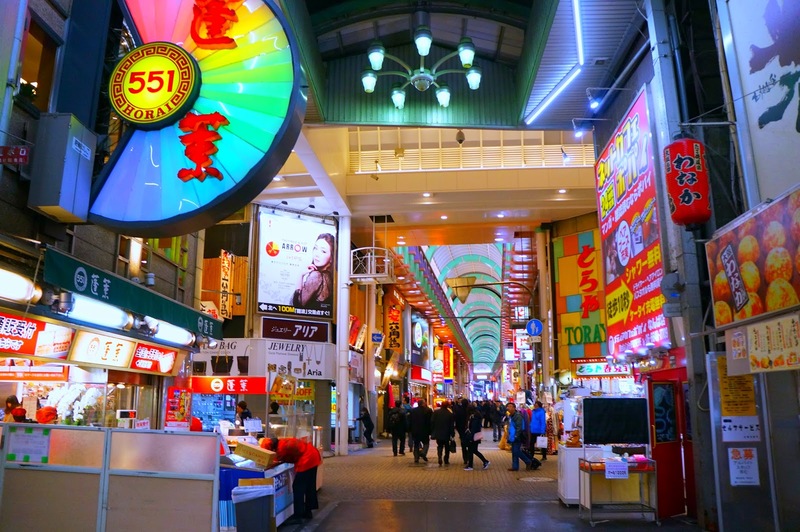 We got on the subway at Tennoji and rode it a few stops to Namba Station, one of the largest in Osaka. We got off and headed for an exit that I thought was in the right direction of where we were going, but once we got to the surface, I was very turned around. Finally, I got my bearings and we walked to the restaurant. When we got there, there were tons of people outside waiting. I peeked inside and it was NOT conveyor belt sushi! Stupid Yelp. We decided to walk to another “sushi” place nearby; again, NOT what we were looking for. Giving up on the research side of things, we chose a street that looked busy and walked down it. Low and behold, after a few minutes, I spied a sushi bar and we excitedly went inside. 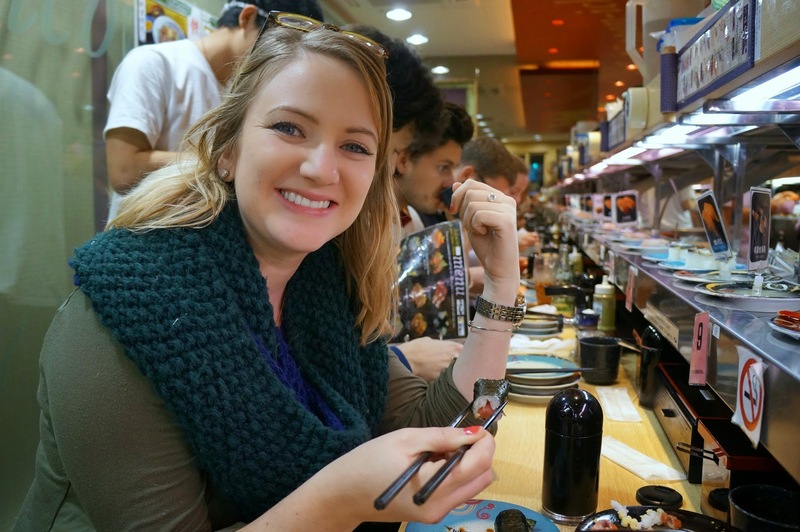 The host showed us to our seats around the bar and we started to look at all the sushi on offering. Most of it was normal, but there were also baby octopus, octopus tentacle, and some other interesting selections. I got some salmon and tuna, and Jessica ordered a couple of rolls (all the sushi on the belt was just sashimi on rice; no rolls). The sushi was good, but not particularly exciting. I think it was the experience of doing this in Japan that made it great. At one point, a man walked behind us and started trying to say something to me, but I couldn’t understand and was a bit bewildered. He kept walking and I realized a few minutes later that he was the sushi chef behind the bar. He talked to us briefly; asked if we were from America, then said something about Obama. We laughed and nodded and continued eating. We eventually finished and paid; I had gotten 5 plates and it was around $7 total. What a cheap last meal! Even including the transportation we were still only around $10. We headed back to our hotel and called it a night.